re-constructed on its original historic ancient site, complete with many different buildings, siege weapons and animals roaming freely throughout the 10 acre site, providing a unique insight into community life in Domesday England. Come and explore the Castle and roam through the Norman village hidden behind the castle walls, wander in and out of the many houses and listen out for the ancient Church bell tolling serenely across the grounds. Mountfitchet Castle is unique as being the only wooden Motte and Bailey castle and village to be reconstructed on it’s original historic site anywhere in the world. 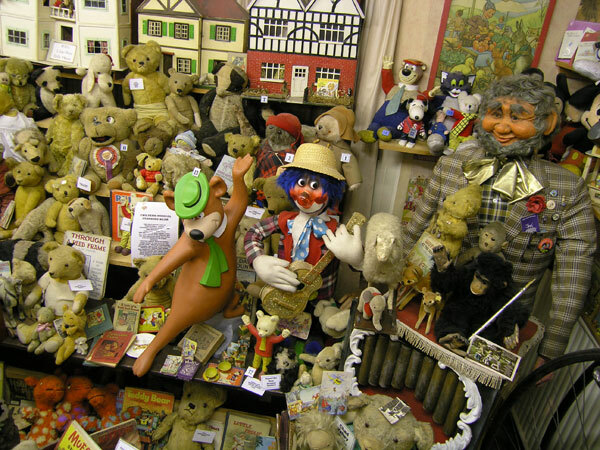 The Toy Museum is the largest one in the world, with at least 80,000 toys, books and games on display from late Victorian times up to 1990’s. How better to see the illustration of the social history of our times portrayed through toys, books, games, music, entertainment and family amusement. The museum also houses a WWI & WWII Blitz and Battle of Britain display, Showbiz Collection and a Rock ‘n’ Roll exhibition. There are many hands-on activities throughout the museum including a puppet theatre, Lego and Brio tables, Quiots to test your skills and WWI & WWII helmets and masks to try on. The Haunted Manor is spookily located within the Toy Museum and if you’re feeling brave enough to visit the bewitched tunnels and chambers a small extra entrance fee applies. But beware…this is not for the faint hearted! Encounter our life sized dinosaurs on the way to the museum and try your hand at Fossil hunting in our Palaeontology House, can you find the Velociraptors claw?